12 Inch Barrel Length Maxload Weighting 3-Piece, 100% Composite Design ASA Approved 1 Year Manufacturer's Warranty. 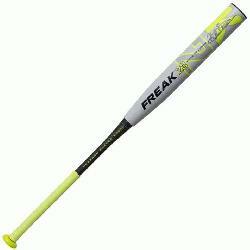 The all new Kyle Pearson signature series Freak 23 Maxload ASA bat returns for round two. The Freak 23 ASA bat, with 12 inch barrel length, pairs Kyle Pearson’s signature maxload weighting with a finely tuned ASA double-barrel to deliver full barrel performance specifically with the use of 52 COR balls. Comes with a 1 year manufacturer's warranty from Miken. - 12 Inch Barrel Length - 2 1/4 Inch Barrel Diameter - Maxload Weighting - Tetra-Core Technology - Flex 2 Power (F2P) Technology - 100 COMP Technology - 3-Piece, 100% Composite Design - ASA Approved - Made in the USA - 1 Year Manufacturer's Warranty.